Two years ago the Dyson Supersonic did to hair-dryers what it had done to vacuum cleaning 25 years before that. By spinning six times faster than the average dryer, the Supersonic dries hair faster at lower temperatures, weighs far less and is much quieter than every other heat emitting dragon out there. It's fair to say that it revolutionised the at home blow dry - for Caucasian hair at least - and despite the ¤400 price tag, has become a huge hit. Obviously, having spent some ¤27m on its hair research labs, Dyson wasn't going to stop there. Sure enough, this week sees the arrival of the Dyson Airwrap, a styling tool that creates curls, waves, ringlets, ribbons… but also blow dries. All, as expected, without extreme heat. Let's be clear: there are other styling tools out there that curl as they blow dry: Babyliss pretty much planted the biggest flag on this territory with its beloved Big Hair range. The advantage of these tools - as opposed to drying your hair with a conventional blow dryer and then curling it with tongues, is that a) you can get volume really close to the roots b) you're only using one source of heat which in theory, should be better for your hair, but doesn't always turn out like that, for reasons that will become apparent. Babyliss Big Hair has a rotating brush, two speeds and for years has been the market leader, with good reason (as someone with fine, limp hair I've tried a bunch of these things in the quest for lasting volume, and always come back to BBH). But the Airwrap is better than anything I've tried. As with the Supersonic dryer, Dyson isn't, strictly speaking, reinventing the wheel, merely taking it to bits and constructing something unlike all its predecessors. 1. The Airwrap uses - surprise, surprise -new technology that creates high speed jets of air that flow across the hair at different pressures. 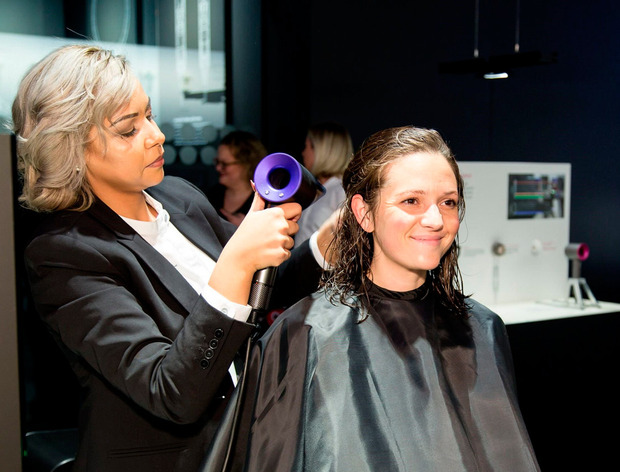 Apart from being less damaging than conventional styling wands and automatically adjusting the direction of the air to ensure a smoother finish, this process, which Dyson calls the Coanda Effect, changes the way the wand is used. Instead of manually twisting your hair around it, the hair automatically wraps itself around the brush. I won't say that tangling - a major menace of conventional rotating styling wands - is impossible, but it's hard to see how it could happen unless you've set your heart on it. Huge win. (I'm not alone in having, on occasions, to cut chunks out in order not to have to go out with a round brush still enmeshed in my hair). 2. The Airwrap comes with an array of detachable wands, including 30 and 40mm smooth barrels and 30 and 40mm brush barrels so that you can create all kinds of styles, from bed head or sleek and bouncy to a full-on Seventies Barbra Streisand mop of tight curls. Some of the competition also has a choice of attachments, but not as many as the Airwrap, and they don't click on and off as easily. 4. The Airwrap comes with clockwise and anti-clockwise rotating barrels, for left and right sides. This is game-changing because even if some of us can just about - after a lot of practice - perfect our technique on one side of our heads, until the Airwrap's inventors had their lightbulb moment concerning the contra-rotating barrels, achieving an identical effect on the other side is the kind of thing that can drive you mad. So what about the cost? Being Dyson, the benchmark setting technology comes with benchmark setting pricing. There are three packages available ; Volume and Shape comes with a pre-styling dryer plus two 30mm barrels and a round brush; Smooth and Control comes with a pre-styling dryer, two x 30mm and two x 40mm brushes and a firm brush. Both cost ¤450 while the Airwrap Complete which additionally has firm, soft and round brushes, is ¤500. If your hair's chin length, like mine, or short, your probably don't need all the extras that come with the Complete. Bottom line: my ribbon waves didn't last any longer than with other tools which was surprising, but on reflection, they could have done with some strong hold hairspray and a longer spurt of the cold air setting to fix them. And I probably need more time to get used to holding the wand correctly - perpendicular to the section of hair I'm drying - and letting the hair glide around the wand, rather than the other way round. On the plus side, the Airwrap gave my hair great volume and movement. The contra-rotating barrels are a genius touch, although the lower heat emissions alone would probably sell it to me. If you regularly use heat to style your hair, this is so much better for its well-being. Also, you only have to look at consumer reviews of the competition, to see how often other styling wands need replacing. This is a more specific tool than the hair dryer, but if you're in the market for a hair wand, be prepared to be seduced - damn it. The Dyson Airwrap will supercharge your styling technique and gradually transform the condition of your hair.